The Roman deities most familiar today are those the Romans identified with Greek counterparts (see interpretatio graeca), integrating Greek myths, iconography, and sometimes religious practices into Roman culture, including Latin literature, Roman art, and religious life as it was experienced throughout the Empire. Many of the Romans' own gods remain obscure, known only by name and sometimes function, through inscriptions and texts that are often fragmentary. This is particularly true of those gods belonging to the archaic religion of the Romans dating back to the era of kings, the so-called "religion of Numa", which was perpetuated or revived over the centuries. Some archaic deities have Italic or Etruscan counterparts, as identified both by ancient sources and by modern scholars. Throughout the Empire, the deities of peoples in the provinces were given new theological interpretations in light of functions or attributes they shared with Roman deities. An extensive alphabetical list follows a survey of theological groups as constructed by the Romans themselves. For the cult pertaining to deified Roman emperors (divi), see Imperial cult. 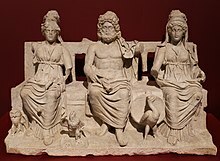 Capitoline Triad: Jupiter, Juno, Minerva. Varro uses the name Dii Consentes for twelve deities whose gilded images stood in the forum. These were also placed in six male-female pairs. Although individual names are not listed, they are assumed to be the deities of the lectisternium. A fragment from Ennius, within whose lifetime the lectisternium occurred, lists the same twelve deities by name, though in a different order from that of Livy: Juno, Vesta, Minerva, Ceres, Diana, Venus, Mars, Mercurius, Jove, Neptunus, Vulcanus, Apollo. Even in invocations, which generally required precise naming, the Romans sometimes spoke of gods as groups or collectives rather than naming them as individuals. Some groups, such as the Camenae and Parcae, were thought of as a limited number of individual deities, even though the number of these might not be given consistently in all periods and all texts. The following groups, however, are numberless collectives. di superi, the gods above or heavenly gods, whose altars were designated as altaria. di terrestres, "terrestrial gods," whose altars were designated as arae. di inferi, the gods below, that is, the gods of the underworld, infernal or chthonic gods, whose altars were foci, fire pits or specially constructed hearths. More common is a dualistic contrast between superi and inferi. The di indigetes were thought by Georg Wissowa to be Rome's indigenous deities, in contrast to the di novensides or novensiles, "newcomer gods". No ancient source, however, poses this dichotomy, which is not generally accepted among scholars of the 21st century. The meaning of the epithet indiges (singular) has no scholarly consensus, and noven may mean "nine" (novem) rather than "new". Augustus, "the elevated or august one" (masculine form) is an honorific and title awarded to Octavian in recognition of his unique status, the extraordinary range of his powers, and the apparent divine approval of his principate. After his death and deification, the title was awarded to each of his successors. It also became a near ubiquitous title or honour for various minor local deities, including the Lares Augusti of local communities, and obscure provincial deities such as the North African Marazgu Augustus. This extension of an Imperial honorific to major and minor deities of Rome and her provinces is considered a ground-level feature of Imperial cult. Augusta, the feminine form, is an honorific and title associated with the development and dissemination of Imperial cult as applied to Roman Empresses, whether living, deceased or deified as divae. The first Augusta was Livia, wife of Octavian, and the title is then shared by various state goddesses including Bona Dea, Ceres, Juno, Minerva, and Ops; by many minor or local goddesses; and by the female personifications of Imperial virtues such as Pax and Victoria. The epithet Bonus, "the Good," is used in Imperial ideology with abstract deities such as Bona Fortuna ("Good Fortune"), Bona Mens ("Good Thinking" or "Sound Mind"), and Bona Spes ("Valid Hope," perhaps to be translated as "Optimism"). During the Republic, the epithet may be most prominent with Bona Dea, "the Good Goddess" whose rites were celebrated by women. Bonus Eventus, "Good Outcome", was one of Varro's twelve agricultural deities, and later represented success in general. From the middle Imperial period, the title Caelestis, "Heavenly" or "Celestial" is attached to several goddesses embodying aspects of a single, supreme Heavenly Goddess. The Dea Caelestis was identified with the constellation Virgo ("The Virgin"), who holds the divine balance of justice. 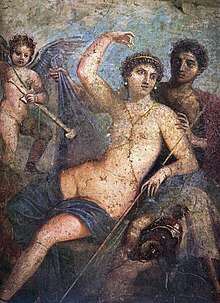 In the Metamorphoses of Apuleius, the protagonist Lucius prays to the Hellenistic Egyptian goddess Isis as Regina Caeli, "Queen of Heaven", who is said to manifest also as Ceres, "the original nurturing parent"; Heavenly Venus (Venus Caelestis); the "sister of Phoebus", that is, Diana or Artemis as she is worshipped at Ephesus; or Proserpina as the triple goddess of the underworld. Juno Caelestis was the Romanised form of the Carthaginian Tanit. Grammatically, the form Caelestis can also be a masculine word, but the equivalent function for a male deity is usually expressed through syncretization with Caelus, as in Caelus Aeternus Iuppiter, "Jupiter the Eternal Sky." 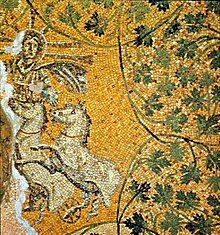 Invictus ("Unconquered, Invincible") was in use as a divine epithet by the early 3rd century BC. In the Imperial period, it expressed the invincibility of deities embraced officially, such as Jupiter, Mars, Hercules, and Sol. On coins, calendars, and other inscriptions, Mercury, Saturn, Silvanus, Fons, Serapis, Sabazius, Apollo, and the Genius are also found as Invictus. Cicero considers it a normal epithet for Jupiter, in regard to whom it is probably a synonym for Omnipotens. It is also used in the Mithraic mysteries. Mater ("Mother") was an honorific that respected a goddess's maternal authority and functions, and not necessarily "motherhood" per se. Early examples included Terra Mater (Mother Earth) and the Mater Larum (Mother of the Lares). Vesta, a goddess of chastity usually conceived of as a virgin, was honored as Mater. A goddess known as Stata Mater was a compital deity credited with preventing fires in the city. From the middle Imperial era, the reigning Empress becomes Mater castrorum et senatus et patriae, the symbolic Mother of military camps, the senate, and the fatherland. The Gallic and Germanic cavalry (auxilia) of the Roman Imperial army regularly set up altars to the "Mothers of the Field" (Campestres, from campus, "field," with the title Matres or Matronae). See also Magna Mater (Great Mother) following. Gods were called Pater ("Father") to signify their preeminence and paternal care, and the filial respect owed to them. Pater was found as an epithet of Dis, Jupiter, Mars, and Liber, among others. "The Great Mother" was a title given to Cybele in her Roman cult. Some Roman literary sources accord the same title to Maia and other goddesses. The indigitamenta are deities known only or primarily as a name; they may be minor entities, or epithets of major gods. Lists of deities were kept by the College of Pontiffs to assure that the correct names were invoked for public prayers. The books of the Pontiffs are lost, known only through scattered passages in Latin literature. The most extensive lists are provided by the Church Fathers who sought systematically to debunk Roman religion while drawing on the theological works of Varro, also surviving only in quoted or referenced fragments. W.H. Roscher collated the standard modern list of indigitamenta, though other scholars may differ with him on some points. Acca Larentia, a diva of complex meaning and origin in whose honor the Larentalia was held . Bona Dea, the "women's goddess" with functions pertaining to fertility, healing, and chastity. Cacus, originally an ancient god of fire, later regarded as a giant. Caelus, god of the sky before Jupiter. Ceres, goddess of the harvest and mother of Proserpina, and one of the Dii Consentes.The Roman equivalent of Demeter [Greek goddess]. Cura, personification of care and concern who according to a single source created humans from clay. Dea Tacita ("The Silent Goddess"), a goddess of the dead; later equated with the earth goddess Larenta. Decima, minor goddess and one of the Parcae (Roman equivalent of the Moirai). The measurer of the thread of life, her Greek equivalent was Lachesis. Di inferi, deities associated with death and the underworld. Dis Pater or Dispater, god of wealth and the underworld; perhaps a translation of Greek Plouton (Pluto). Falacer, obscure god. He was assigned a minor flamen. Fauna, goddess of prophecy, but perhaps a title of other goddesses such as Maia. Febris, "Fever," goddess with the power to cause or prevent fevers and malaria. Felicitas, personification of good luck and success. Feronia, goddess concerned with wilderness, plebeians, freedmen, and liberty in a general sense. Fornax, goddess probably conceived of to explain the Fornacalia, "Oven Festival." Fontus or Fons, god of wells and springs. Fufluns, god of wine, natural growth and health. He was adopted from Etruscan religion. Furrina, goddess whose functions are mostly unknown, but in archaic times important enough to be assigned a flamen. Hercules, god of strength, whose worship was derived from the Greek hero Heracles but took on a distinctly Roman character. Honos, a divine personification of honor. Invidia, goddess of envy and wrongdoing. Juno, Queen of the gods, goddess of matrimony, and one of the Dii Consentes. Equivalent to Greek Hera. Jupiter, King of the gods, god of storms, lightning, sky, and one of the Dii Consentes; was assigned a flamen maior. Equivalent to Greek Zeus. Lucina, goddess of childbirth, but often as an aspect of Juno. Lupercus, god of shepherds and wolves; as the god of the Lupercalia, his identity is obscure, but he is sometimes identified with the Greek god Pan. Manes, the souls of the dead who came to be seen as household deities. 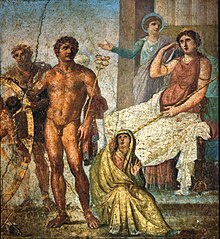 Mania, the consort of the Etruscan underworld god Mantus, and perhaps to be identified with the tenebrous Mater Larum; not to be confused with the Greek Maniae. Mantus, an Etruscan god of the dead and ruler of the underworld. Mars, god of war and father of Romulus, the founder of Rome; one of the Archaic Triad assigned a flamen maior; lover of Venus; one of the Dii Consentes.Greek equivalent-Ares. Mater Matuta, goddess of dawn and childbirth, patroness of mariners. Mellona or Mellonia, goddess of bees and bee-keeping. Mena or Mene, goddess of fertility and menstruation. Mercury, messenger of the gods and bearer of souls to the underworld, and one of the Dii Consentes. Roman counterpart of the Greek god Hermes. Minerva, goddess of wisdom, war, the arts, industries and trades, and one of the Dii Consentes. Roman equivalent of the Greek goddess Athena. Morta, minor goddess of death and one of the Parcae (Roman equivalent of the Moirai). The cutter of the thread of life, her Greek equivalent was Atropos. Mutunus Tutunus, a phallic god. Nemesis, goddess of revenge (Greek), adopted as an Imperial deity of retribution. Neverita, presumed a goddess, and associated with Consus and Neptune in the Etrusco-Roman zodiac of Martianus Capella but otherwise unknown. Nixi, also di nixi, dii nixi, or Nixae, goddesses of childbirth,. Nona, minor goddess, one of the Parcae (Roman equivalent of the Moirai). The spinner of the thread of life, her Greek equivalent was Clotho. Nortia a Roman-adopted Etruscan goddess of fate, destiny, and chance from the city of Volsinii, where a nail was driven into a wall of her temple as part a new-year ceremony. Ops or Opis, goddess of resources or plenty. Portunus, god of keys, doors, and livestock, he was assigned a flamen minor. Priapus, imported phallic guardian of guardians. Querquetulanae, nymphs of the oak. Quirinus, Sabine god identified with Mars; Romulus, the founder of Rome, was deified as Quirinus after his death. Quirinus was a war god and a god of the Roman people and state, and was assigned a flamen maior; he was one of the Archaic Triad gods. Silvanus, god of woodlands and forests. Tellumo or Tellurus, male counterpart of Tellus. Terra Mater or Tellus, goddess of the earth and land. The Greek equivalent is Gaea, mother of titans, consort of Caelus (Uranus). Vacuna, ancient Sabine goddess of rest after harvest who protected the farmers' sheep; later identified with Nike and worshipped as a war goddess. Vagitanus, or Vaticanus, opens the newborn's mouth for its first cry. Venti, the winds, equivalent to the Greek Anemoi: North wind Aquilo(n) or Septentrio (Greek Boreas); South wind Auster (Greek Notus); East wind Vulturnus (Eurus); West wind Favonius (Zephyrus); Northwest wind Caurus or Corus (see minor winds). Viduus, god who separated the soul and body after death. ^ Varro, Divine Antiquities, book 5, frg. 65; see also Livy 1.32.9; Paulus apud Festus, p. 27; Servius Danielis, note to Aeneid 5.54; Lactantius Placidus , note to Statius, Theb. 4.459–60. ^ Hendrik H.J. Brouwer, Bona Dea: The Sources and a Description of the Cult pp. 245–246. ^ Benko, Stephen, The virgin goddess: studies in the pagan and Christian roots of mariology, Brill, 2004, pp. 112–114: see also pp. 31, 51. ^ CIL 03, 11008"A soldier of the Legio I Adiutrix [dedicated this] to the Unconquered God" (Deo Invicto / Ulpius Sabinus / miles legio/nis primae / (A)diutricis). ^ Steven Ernst Hijmans, Sol: The Sun in the Art and Religions of Rome (diss., University of Groningen 2009), p. 18, with citations from the Corpus Inscriptionum Latinarum. ^ Lawrence Richardson, A New Topographical Dictionary of Ancient Rome (Johns Hopkins University Press, 1992), pp. 156–157. ^ R.W. Davies, "The Training Grounds of the Roman Cavalry," Archaeological Journal 125 (1968), p. 73 et passim. ^ Macrobius, Saturnalia 1.12.16–33. Cited in H.H.J. Brouwer, Bona Dea: The Sources and a Description of the Cult (Brill, 1989), pp. 240, 241. ^ Dea feminarum: Macrobius, Saturnalia I.12.28. ^ Hyginus, Fabulae 220; compare Prometheus.